Барааны дугаар 9780521702027. Categories: CAMBRIDGE, Skills. Do you feel unprepared for everyday life in an English-speaking world? 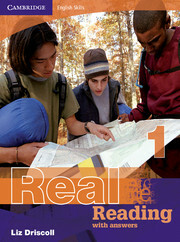 Then Real Reading could be just what you need, whether you’re studying alone or in the classroom. Cambridge English Skills is a four-level skills series specially designed for adults and young adults wanting to communicate confidently in English wherever they are – at home, at work, travelling, studying or socialising with English-speaking friends. * Focusing on the themes of ‘Work and Study’ and ‘Social and Travel’, the series builds confidence through activities based on everyday situations and texts. * Learning tips throughout the book help students develop strategies for reading difficult texts. * ‘Extra practice’ extension tasks encourage students to take their learning off the page and provide more real world reading practice. * Unit-by-unit checklists, based on ALTE Can-do statements, let learners see what they’ve achieved – and feel proud of it!